Mothers play a huge role in their daughters’ life; not only do they bring them into the world but they teach them how to live in it too. But that’s not to say daughters can’t teach their mums a thing or two too; there’s wisdom to be had both ways… especially when it comes to beauty! Makeup, skincare and fragrance trends are ever changing. That’s why many mothers rely on their daughters (and sons) to keep them up to date on the latest innovations, ingredients, methods and of course, the products everyone’s raving about. 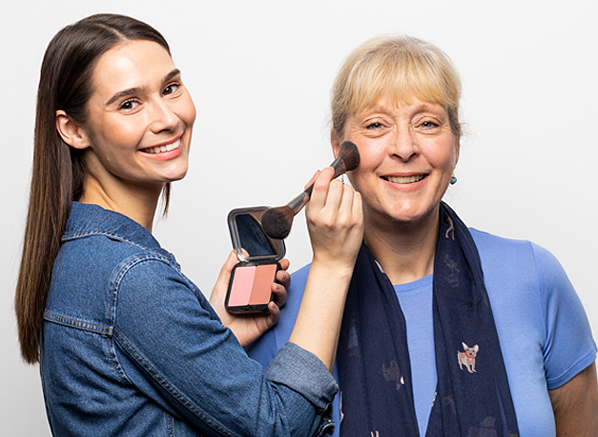 That’s why this Mother’s Day we’re going against the grain and giving mums a platform to thank their daughters for keeping them up to date on all things beauty. Tempted by the thought of a primer? This edit has all the best ones for combination skin! Curious about retinol? Learn all about it (from Chelsey herself) here. Do you have a way to go with your cleansing routine? This edit will help get you started. “I’m always asking my daughter, Ceryn about the best beauty products. Just recently I was asking her about the best eye cream for my dark circles – the older I get the more I dislike them. Luckily, she had a recommendation straight away with The Ordinary Caffeine Solution. I’ll admit, I’m not one for an overdone skincare routine but I’m happy to do this extra step because the results have been wonderful. It’s early days but I’m already feeling more confident. On the hunt for the best anti-ageing serum? Read this Double Serum edit. Intrigued by the sound of Mineral 89? Here’s the review with all the details. “I always like nice, refreshing fragrances, which my daughter knows and she regularly updates me on the best ones to try. Last year, Monika introduced me to Roger & Gallet Fleur de Figuier and I love it. It’s so fresh but sweet and its aroma is so perfect for every day. I highly recommend this to anyone looking for a new spring scent! You can explore Fleur de Figuier and a few more Roger & Gallet favourites in this round-up. This entry was posted on Tuesday, March 26th, 2019 at 8:53 am and is filed under Uncategorized. You can follow any responses to this entry through the RSS 2.0 feed. You can skip to the end and leave a response. Pinging is currently not allowed.